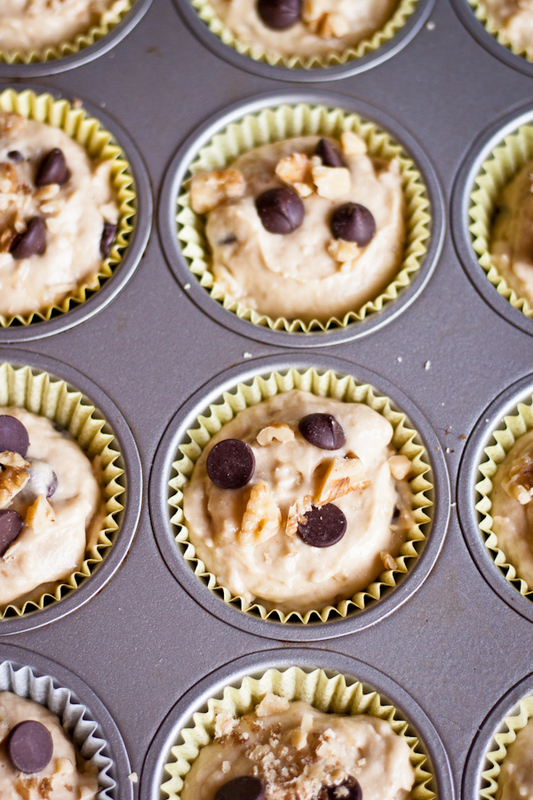 Sometimes life calls for a basic banana chip muffin. 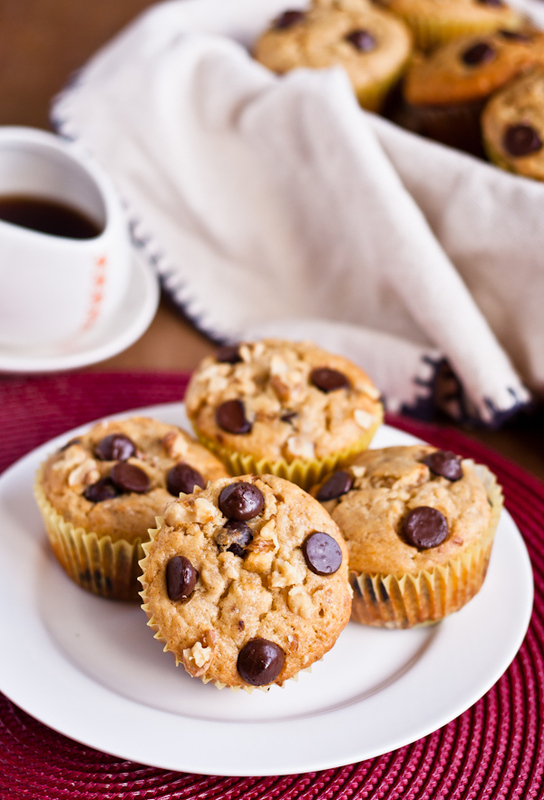 A simple and modest banana chip muffin. Nothing too fancy or over the top. Or overly complicated. There are no surprises with this recipe, folks. It’s not stuffed with anything (which is then stuffed with something else) and there is no secret ingredient. It’s an every day, I-have-every-ingredient-lying-around-already kind of recipe. Obviously, dead bananas are mandatory–but I seem to have some of those available at all times of the week. Let’s just say that Connor has a little bit of a problem when it comes to buying bananas. As in, he seems to always buy enough for a small army. Not a tiny household of two. Luckily (or unluckily, depending on how you look at it), this means that I can pretty much whip up a batch of banana bread or muffins any day of the week. 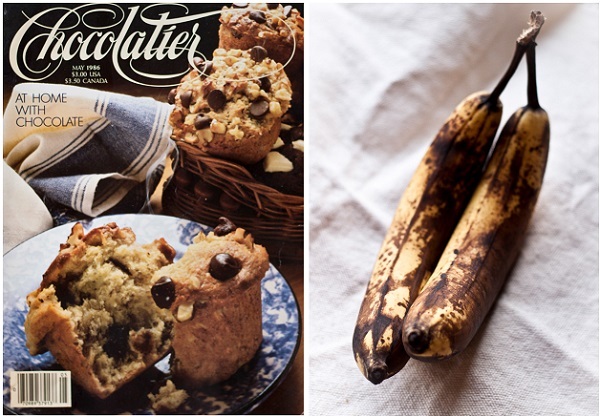 So when I happened upon this simple recipe, accompanied by a mouth-watering cover photo on a 1986 issue of Chocolatier, that’s exactly what I did. The batter comes together incredibly quickly and is simply a mixture of beaten butter and brown sugar, mashed banana, a little bit of milk (use whatever you have on hand), vanilla extract, all-purpose flour, baking soda, baking powder and salt. You then stir in walnuts and chocolate chips, before topping them off with more chocolate chips and walnuts. Both steps are mandatory. 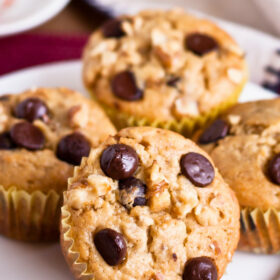 The resulting muffins are fluffy and delicate in flavor, with just the right amount of texture from the walnuts and chocolate-y goodness from the chips, and taste great as a slightly more decadent breakfast or as a snack. Since I don’t trust myself around copious amounts of baked goods, I sent most of these off with Connor to give to his fellow medical school friends and residents at the hospital. I have to admit, I’m very happy to have discovered a new built in recipe taste-testing panel for the blog. How convenient! [Verdict? They loved them]. Preheat the oven to 375 degrees Fahrenheit. Grease or line a muffin tin with liners. Whisk together the flour, baking powder, baking soda, and salt in a small bowl–set aside two teaspoons and toss this with the walnuts and chocolate chips. Set aside. Using a stand mixer or a hand held mixer with a paddle attachment, beat the butter and sugar together over medium speed until soft and fluffy–2-3 minutes. On low speed, add the slightly beaten eggs, scraping down the bowl several times, until mostly incorporated. Add the mashed banana and vanilla and mix until just combined. The mixture will look slightly lumpy and curdled. On low speed, alternate with three additions of flour and two additions of milk (starting and ending with the flour) and mix until just barely incorporated. 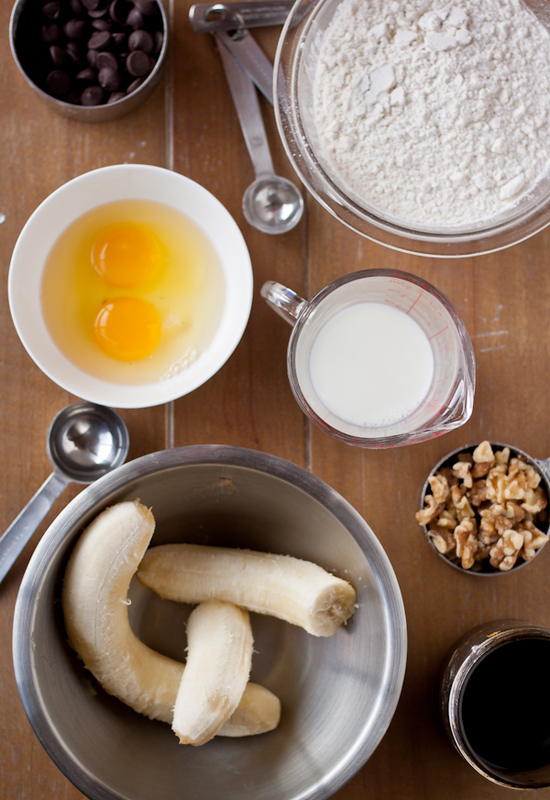 Reserving two tablespoons of each, add the chocolate chips and walnuts to the batter. Scrape down the bowl with a spatula to ensure the ingredients are mixed thoroughly. Using an ice-cream scoop or a spoon, divide the batter among the muffin tins. 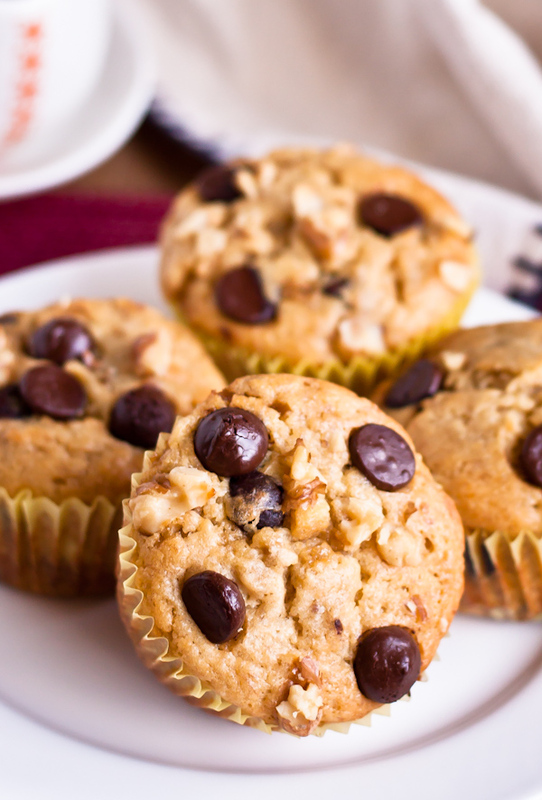 Top the muffins with the remaining chips and walnut pieces. Bake for 23-25 minutes, or until a cake tester inserted into the center comes clean. Allow muffins to cool in the pan on a rack for 5 minutes, before removing. Serve warm or cool completely. 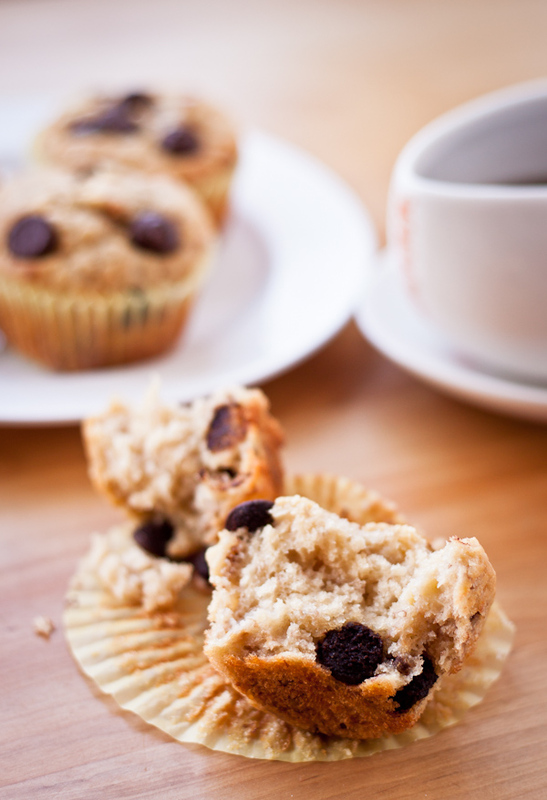 Muffins can be stored in an airtight container for up to 2-3 days, but are best eaten the day of baking. Recipe from the May 1986 issue of Chocolatier magazine.